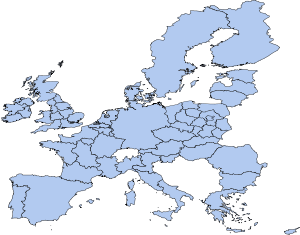 ConservativeHome’s Platform: Anthony Browne: Time for European localism. In this article, Anthony Browne, a former Brussels correspondent for the Times, argues that there is a contradiction in the Liberal Democrat ideology – between Localism and Pro-Europeanism. It seems that if we support centralising powers at a European level, we are being hypocritical in supporting localism. He argues that the debate should not be about being pro- or anti- Europe, but about “which powers are held at what level”. For example, a British space programme works best at a European level, but he claims that working hours control should be national. I wholeheartedly agree – as does the EU. While Browne claims that pushing the EU principle of subsidiarity did nothing under Thatcher, I don’t agree. It worked, what ruined things was her inability to compromise, with any other level of governance. Anyway, I digress into an anti-Thatcher rant. Frankly, the crux of the matter is that I agree, as does the EU. Subsidiarity is still a valid legal principle, and is used everywhere in the EU. For those who don’t know, subsidiarity means that powers should operate at the lowest level which is effective. I would simply argue that cooperating at the EU level makes most things more effective. Not just our space programme (a great success), but economic policy with our closest and largest trading partners, military policy with the only countries which truly have the same security interests, social policy with similar societies. Those are grand examples, and a far off concept, but cooperating, even just a little, on many, many varied issues, could infinity improve efficiency. We could argue that minimum wage should be different according to region – it should be lower in Scotland, Bulgaria and Poland and higher in London, Sweden and Paris, to reflect differing costs of living. OK, I can be tempted by that. Localism, within a European state. If this is the compromise we need to come to in order to solve the European schism in British society then it’s one I’m perfectly willing to make. I would also draw note to something – Browne seems to argue that the predominately-Conservative Eurosceptic faction should… well, fight the pro-Europeans, and go on the offensive. I would think it was decidedly more sensible to actually cooperate, figure out together at which level we wish to place each power, rather than degenerating into divisive nationalist.